Slider Revolution (Revolution Slider) is an innovative, responsive WordPress Slider Plugin that displays your content the beautiful way. Whether it’s a Slider, Carousel, Hero Image or Video Scene for best conversion rates or even a whole Front Page, the visual, drag & drop editor will let you tell your own stories in no time! Desktop or mobile device! 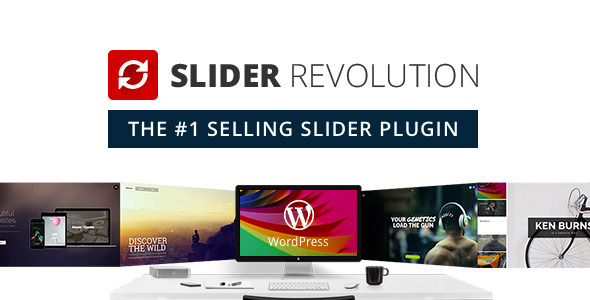 Slider Revolution is not only for WordPress Sliders. You can now build a beautiful one-page web presence with absolutely no coding knowledge required. To get you started fast, we included a ton of premade examples that come with all assets included! Building a WordPress slider has never been easier! Even though Slider Revolution is sporting an impressive number of options, even beginners will manage to create beautiful presentations with our new, more intuitive workflow. We made sure that our Slider Revolution WordPress Slider plugin looks great and is intuitive to use on every device, be it desktop computers, tablets or smartphones. We want Slider Revolution to integrate into your WordPress website as seamlessly as possible. Why not show any content with it? Our Slider Revolution WordPress Plugin is regularly audited by professional researchers at Dewhurst Security to make sure that it’s no threat to the security of your WordPress website. Good looks aren’t everything, so we made sure that WordPress Slider Revolution also loads lightning fast! Our premise is “less is more” and that is reflected in the structure of our components. In order to incorporate so much functionality into our plugins, we make sure everything is build as modular as possible. We want Revolution Slider for WordPress to be able to fulfill all slide based roles along with special functionality like carousels and hero blocks. If you can’t find a specific feature, feel free to ask us! Layers have evolved from simple layers to become powerful scene building tools! 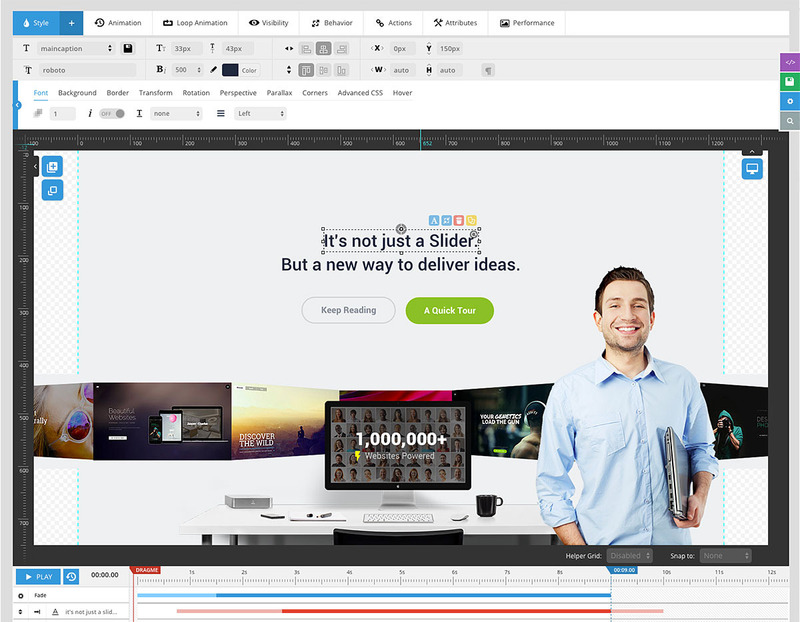 Drag and Drop, Customize & Animate your way to your perfect slider. We have implemented almost all navigation types you can think of, which can be aligned anywhere on the stage. Be in full control with Slider Revolution Navigation! Bullet, Button, Tabs and Thumbnail Navigation, single or mixed mode. Any position like outter,inner, aligned etc. Slider Revolution is not just your ordinary image & video slider any longer. 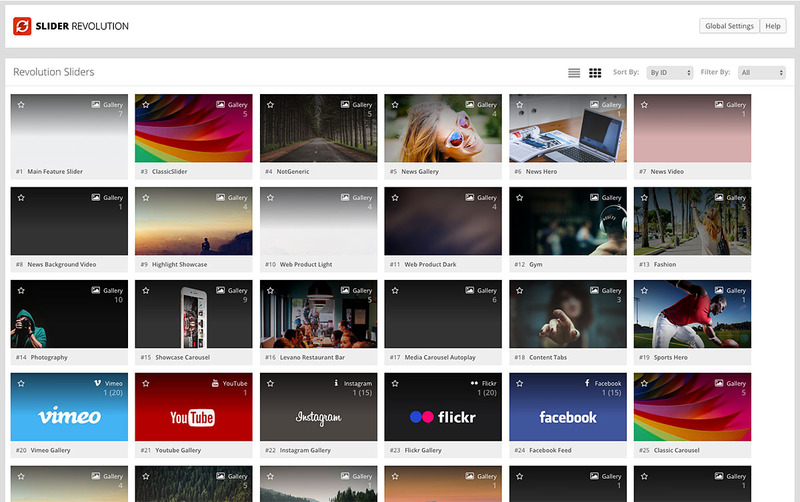 Now you can also pull the sliders content from popular social media steams. Is there a feature you would like to see? We will go through all your feedback weekly and pick the most requested features to be included in a future update!